We are a couple of days out from The Walking Dead airing its midseason finale, but if you still haven’t caught the episode, please note that we do get into spoilers in this article. If you’ve been paying any attention to The Walking Dead, there’s a good chance you’ve heard many of the complaints from fans who were spoiled about a big moment from Sunday’s midseason finale. Unfortunately, many of those people who were spoiled actually found out through The Walking Dead’s own official Facebook page before the episode aired on the West Coast and elsewhere across the world. Fittingly, The Walking Dead took to the social media site to apologize this week, and you can take a look at what the page has to say, below. On Sunday night, just a short while after The Walking Dead finished airing on the East Coast, the Official Walking Dead page jumped the gun, posting a picture of a dead Beth being carried by Daryl. Pushing the spoiler even further was the caption "RIP Beth," which confirmed to a slew of Walking Dead fans on the west coast and elsewhere that poor sweet Beth was dead even before the episode had a chance to begin airing. While the Facebook page did eventually pull the post for a short time before re-posting the sentiment after the later airings, the damage was done. 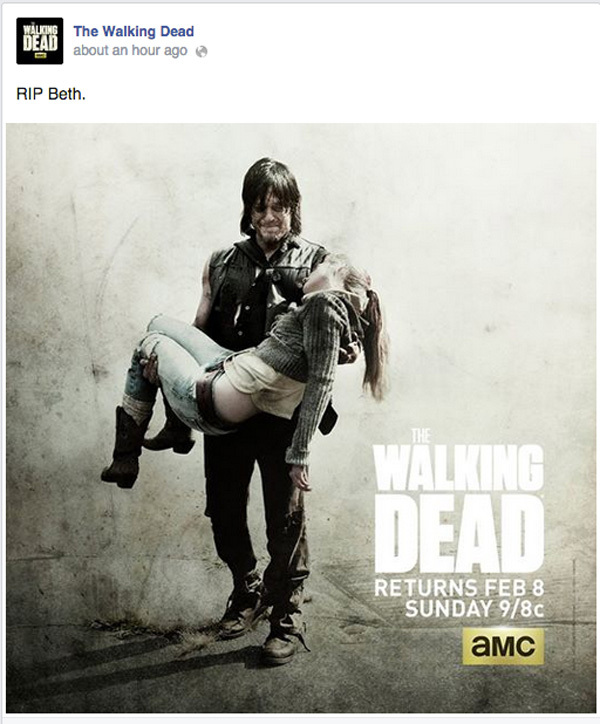 Obviously, Beth’s death on Sunday’s episode offered a water cooler moment for fans of AMC’s hit zombie series. People wanted to talk about the shocking and tragic moment, and the Facebook page was likely wanting to produce a space where people could come together and talk about what just happened. As the apology post notes, the post was not a sneaky or cruel attempt to spoil people who hadn’t caught the episode. The Walking Dead's social media team is sorry, and is working to make sure it doesn’t happen again. As you’ll notice, though, the apology only specifically mentions those West Coast American viewers who were spoiled about Sunday’s big episode. So, if you live elsewhere in the world, you might still be up the creek without a paddle. Consider yourselves forewarned. AMC’s The Walking Dead is currently on hiatus, but new episodes are expected to premiere in February of 2015.